She’s the queen of coaching, has presented on countless Masterclass videos and, having been an Instructor for 28 years, knows something about achieving longevity in teaching. Kylie Gates, one of the key figures behind the new Advanced Training course, opens up on leadership, being authentic and what still gets her out of bed to teach at 5am. Hi Kylie, you were heavily involved in producing the content for the new Advanced Training course. Can you tell us how the leadership element evolved? The whole leadership conversation started when Jackie Mills and I had an opportunity to brainstorm, what type of Advanced Instructor do we want to create? I thought back to an Instructor session I ran a few years ago in Canada. I asked, “Who here thinks of themselves as a leader?” And out of 400 people, two people put up their hands. So I said, “But we’re all Group Fitness leaders”. That was the beginning of starting to shift the mindset – from fitness Instructor, to fitness leader. But why is it important to think of ourselves as Group Fitness leaders? Leaders have a purpose, they know who they are, and what they stand for. Leaders have a “calling” – an overarching reason of why they do what they do. Research shows that when you view your job as a calling, then it leads to higher levels of job satisfaction. Your calling is something that’s bigger than you – it’s what gets you out of bed in the morning because you know you’re part of something that matters. Everyone has days they don’t want to do it but you do it for the Tribe and for the members and for the bigger picture… having a calling leads to better health, feelings of worth, a sense of accomplishment, and feeling connected to other people. What does the journey to becoming a leader look like? At the beginning, you need to find people to learn from, who can be your role model for leadership. It’s like when you start teaching – you have a role model who you base yourself off, and then eventually you grow and you find your own voice. You need to think about what are the qualities and attributes of somebody you would want to be like. Jackie [Mills] is a role model for me. She does things which make me think, yeah, I want to be like her. One thing that great leaders have is a growth mindset – they look for opportunities to grow and keep getting feedback. We know that feedback is the key to ensuring that you are continuously growing as an Instructor - and the best Instructors in the world are those who are hungry for feedback. One of the key tools you will take away from Advanced Training is to learn how to self-assess, so that you can really own your journey, and have the ability to feedback on your own teaching. The next step to becoming a leader is to ask, how am I going to empower and influence the people in my class? What’s important to me? What do I want to share? Because the greatest way to show leadership is to role model it. And being an Instructor gives us this amazing platform from which we can lead. In Advanced Training, you talk about finding your “why”. Can you expand on that? Knowing your why is about finding out what makes you and your teaching unique, and we spend a lot of time on this in Advanced Training. We ask, how are you going to show up today? What’s the thing that you bring? It’s about uncovering what it is that makes you tick – what drives you to do the things that you do. Understanding your driver is what ensures longevity in teaching. I’ve been an Instructor for 28 years, and my why has changed over the years – what I had in my 20s is not what I have now. My why used to be all about technique and pushing for perfection. Now - I’m genuinely grateful that my members show up! My mentality is completely different. In the trials for Advanced Training, we found that Instructors’ whys could change over the course. So you might start by saying, “I love being on stage”, but then you dig deeper, and it might actually be around something completely different. You keep peeling back the layers until you find what it is that really matters to you. How has your why changed over the years? My why now is around contributing. I get my sense of self-worth and purpose from contributing, it’s what drives me and fills me up and makes me feel good everyday – kind of like a healthy drug! Years ago, my focus was always around technique because I was an ex-dancer, but that’s changed and evolved with time. I remember the class where I decided I wasn’t just going to be a technical teacher any more – I made that switch to being more open and authentic. One day I was teaching BODYBALANCE/BODYFLOW and suddenly I started to really hear and feel the music and emotions and all these words came out and I was like, woah, where did that come from? But it was because I had realised that I needed to be myself. And I thought, if I’m feeling this stuff, then other people are feeling it too, and it’s nothing to be ashamed of. It was important for me to express that. Your why ties in with your values. Where I have opportunities in my classes, I will try to bring in subtle meanings to my coaching, and if my members are going through something – some kind of struggle – then it will resonate with them. This is not something I script – all I do is be present with my class, in the moment... this allows me to go there, and that’s what makes it authentic. Now, I never teach with a mask on. It’s like, OK, here I am. Sometimes I’ll say things you’re probably not ready for! I need to stand up and be brave. I stand for something. I stand for the Tribe and for getting people to be fitter – and not just in their bodies, but also in their minds. How has this changed the experience for your participants? When I teach, I expose my heart and be real because I know the real uniqueness of me will help create the experience that will stay with people after class. Ask yourself, what are some of the greatest experiences you’ve had in fitness classes? How did the Instructor make you feel, and how did they achieve it? Because it’s not just about getting the correct pose or having the perfect deadlift. It’s way more than that – it’s about how we make people feel. That’s what they remember. They won’t remember all the moves or the technique, but they will remember how they felt in the experience. 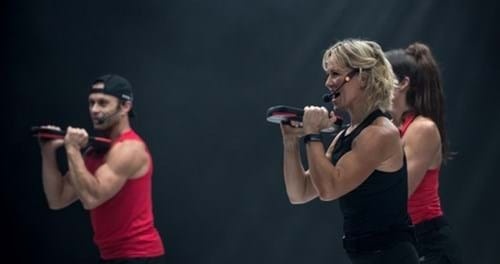 That’s what a great Group Fitness leader does – they use the combination of the music and the movement, and what they say and show to immerse the class in the experience. To do this, you need to find out what your unique gift is – and that’s exactly what the new Advanced Training course has been designed to do. When I first started, I never thought I’d be teaching 30 years on, but I will be, and probably 40! The reason I’ve managed to keep on teaching and loving it is that I stay engaged by knowing my purpose, my why, and by continuously striving to keep improving the experience for the people in front of me. Advanced Training launches in the US, UK and the Nordics in January 2019. Watch this space for updates on when the new training will become available in your country.